Pele Speaks is finished. It’s the first piece in my newly created Mother Earth Speaks series. Pele Speaks is 24” x 44”, wool cloth strips and wool yarn on linen foundation. I’ve learned some things about lava while creating this piece, such as the names of different kinds of lava. See my blog from last week if you missed that. This week, I’d like to discuss the goddess Pele, otherwise known as Pelehonuamea. She is the goddess “who shapes the sacred land”. As she devours the Big Island, she is creating new land at the same time. In my shamanic studies, the goddess of the South, land of heat and fire, is She who creates life and death. This certainly describes Pele. There are many folk tales about this fiery goddess. She can appear as a young woman or an old woman, sometimes accompanied by a white dog. Her image can show up in photos of the lava lake within the crater or molten lava flows. She may be a woman dressed in white, who appears and then disappears. She is revered and respected. Travelers to Hawaii are warned against taking home any lava rock, which is a sacred piece of the fire goddess. Bad luck will befall anyone who removes it from Pele’s home. Those of you of a “certain age” like me, might remember way back to 1972 when there was an episode of The Brady Bunch about the family’s trip to Hawaii. The boys gain possession of a small carved tiki, which they think is a fun souvenir, but it quickly brings them all kinds of bad luck. They wise up and put the tiki back where they found it. Lesson learned. There’s a lot of beauty out there and in the fiery goddess, Pelehonuamea. P.S. Come back next week when I’ll be doing a BOOK GIVEAWAY. I know you love these as much as I do! Pele Speaks, wool cloth strips and yarn on linen foundation. Designed and hooked by Karen Larsen, Crow's Foot Farm Designs, LLC ©2018. 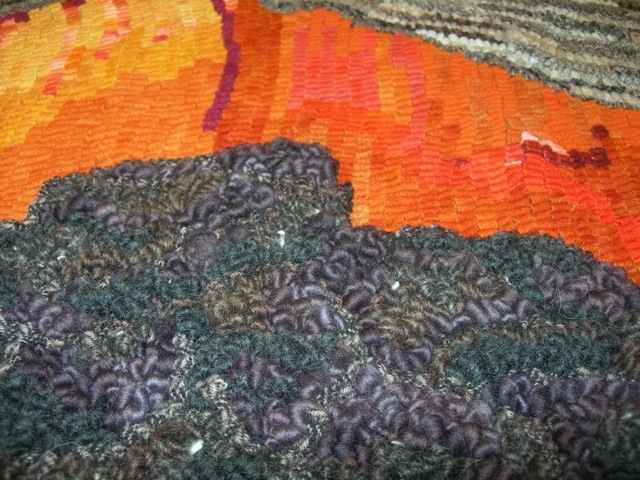 A close up of the hooked yarn billowy pahoehoe lava.